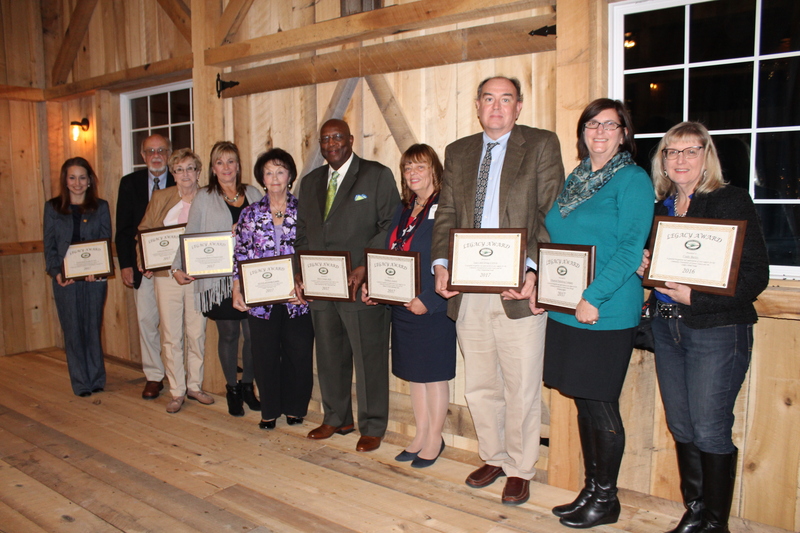 The Community Foundation of Greene County recently celebrated local philanthropy with a dinner at Valley View Farm Venue near Waynesburg. During the dinner CFGC Board of Directors, Chairman, Dr. Morris Harper noted that the Foundation has distributed nearly three million dollars in grants and scholarships to benefit the Greene County community since 2001. According to Dr. Harper, those grants and scholarships were made possible only because of the philanthropy by many of those attending who had established endowed funds or made gifts to various funds at the Foundation. A.C.T.S. of Greene County for support of the Greene County Weekend Food Fund. Cindy Bailey for establishing the Cindy’s Wind Fund for Women and Girls, an endowed Field of Interest Fund. Community Bank for their support and assistance through sponsorships and in-kind donations. Lucy and Doug Corwin for their ongoing support of CFGC through unrestricted gifts. Bob Finnegan – for support of the Jesse Benson Finnegan Scholarship Fund. First Federal Savings and Loan Association of Greene County for their support of the Weekend Food Program, Community Builders Program and the EITC Pre-K Scholarship Program. First National Bank of Pennsylvania for their support of the EITC Educational Improvement Fund providing grants to public schools for innovative curriculum activities. Nelson and Bernice Fox for their dedication in working to establish a new fund. Dr. Morris Harper – for his ongoing support of CFGC in building a new grant fund and providing unrestricted support for CFGC. Lisa and David Jordan for their ongoing support of CFGC through unrestricted gifts. Jeff and Dr. Helen McCracken for their ongoing support for the operation of CFGC. Thelma Szarell for establishing a new endowed scholarship fund to benefit a student graduating from West Greene High School. Greene County Memorial Hospital Foundation – grant for the Weekend Food Program Fund. Observer Reporter/Observer Publishing Company for their gracious support and assistance furthering our media outreach through advertising and sponsorship opportunities. Waynesburg University Bonner Scholars – for supporting the Greene County Weekend Food Fund through the Empty Bowls event. CFGC Executive Director, Bettie Stammerjohn announced the recipients of the Foundation’s prestigious Bridge Society Award which was established in 2008 to recognize professional advisors such as attorneys, financial planners, accountants, bankers, and insurance agents who have helped clients achieve their charitable goals through gifts to the community foundation. 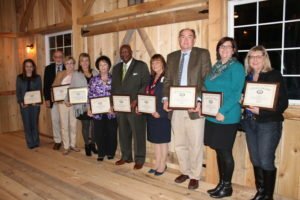 Annual membership in the Bridge Society is granted to professional advisors who have referred or assisted in educating clients, which resulted in a gift of any size to the Community Foundation in any given year and recognized with an engraved plaque. Judi Goodwin Tanner, Chief Executive Officer of First Federal Savings & Loan Association of Greene County received special recognition as a recipient of the William R. Davis Award. The William R. Davis Award recognizes a professional advisor who refers clients resulting in cumulative gifts of at least $250,000. This award is named for attorney William R. Davis who provided legal expertise and advice during the founding years of the Foundation. Until his untimely death in 2007, Bill led the way in helping to educate and inform colleagues and clients about the Community Foundation and our mission to help make Greene County a better community.  The Community Foundation of Greene County (CFGC), a private, non-profit 501(c)(3) organization founded in 2000, is the central philanthropic vehicle in Greene County for donations of various types and sizes. CFGC currently manages nearly $5 million in assets through more than 75 different endowed and restricted funds. Recipients of the CFGC 2017 Legacy Award from left to right: Courtney Schroyer for First Federal Savings and Loan Association of Greene County, Nelson and Bernice Fox, Sheila Stewart for First National Bank of Pennsylvania, Beth Weaverof A.C.T.S of Greene County, Morris Harper, M.D., Thelma Szarell, Doug Corwin, Lucy Corwin for the Observer Publishing Company, and Cindy Bailey. 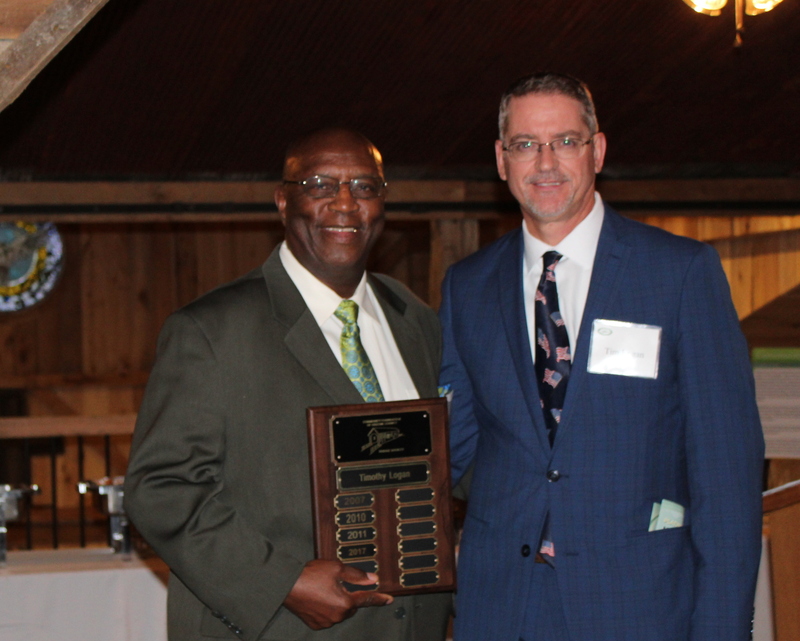 CFGC Board Chairman, Dr. Morris Harper (left) presents the CFGC Bridge Society Award for 2017 to attorney Tim Logan of Waynesburg for his work as a professional advisor in helping clients achieve their charitable goals through gifts to the Community Foundation. 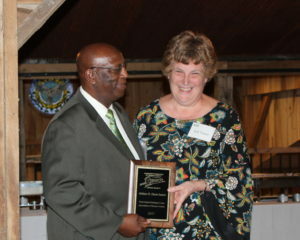 CFGC Board Chairman, Dr. Morris Harper (left) presents Judi Goodwin Tanner, Chief Executive Officer of First Federal Savings and Loan Association of Greene County with the William R. Davis Award of the Bridge Society recognizing cumulative gifts of more than $250,000 to support CFGC grant programs.